Currently based in Hong Kong, David Pilling is the Asia Editor of the Financial Times . He was Tokyo Bureau Chief from 2002–8. After the earthquake in 2011, he came back to Japan on a number of occasions. This book covers the recent history of Japan interlaced with interviews with Japanese from all walks of life. It is essential reading for anyone who wants to understand Japan in the current age. Starting in the small coastal town of Rikuzentakata a mere 40 kilometres from where I spent the first three years of my life in Japan, Pilling recounts the story of a hotel general manager and the fateful day that changed his life and the lives of 23,000 other inhabitants of the town. He talks of the miracle Lone Pine that stood while 70,000 others fell on that fateful Friday in March. The before-and-after photos and words on a page don’t fully capture how harrowing the difference is. An entire Mos Burger restaurant, Japan’s equivalent of McDonald’s, floats across the valley like some unmoored boat, its red roof and ‘M’ logo distinctly visible as it sweeps towards the hospital. By the time it gets there, it has been ripped in two. I remember walking in amongst the trees remarking how huge Japanese crows were (like ravens), and how their voices sounded like grown men’s; picking up a stray volleyball as I walked on the beach, passing it back to some high school kids. Later that evening, I remember sipping beers, eating barbecue meat and camping out under the stars with my new-found teacher mates on the JET Programme. I went back there a few times over the years – to see the annual taiko festival, to watch a traditional street festival where men pulling floats would bash into them into one another, and to eat ramen after running in Ofunato further along the coast. After I moved further north, I didn’t go back there again. Not until six months after the disaster. I saw the Lone Pine with my own eyes in September 2011 when I went to volunteer with All Hands. I couldn’t help but feel sad at seeing nothing but flat land where houses had once been. And a single tree where a forest had once stood. In much the same way that we show signs of aging (not linearly but in sudden leaps and bounds) Japan has lurched forward and re-defined its direction through various events. Pilling goes back in time to chart Japan’s forced opening by Commodore Perry’s Black Ships off Yokohama, which brought about the Meiji Restoration but didn’t spell change in the shimaguni (island country) mindset. He also tells the story of expansionist Japan aspiring to be like the Western colonial powers around the turn of the 20th Century; the 1923 Tokyo earthquake; and the devastation of WWII; through the miracle years of growth, surviving not one but two oil shocks in the 1970s; through the bursting of the Bubble in 1990. 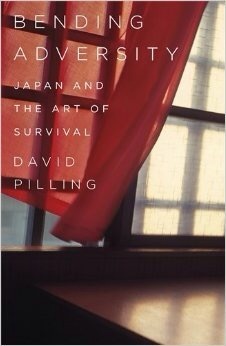 Writing only a year after the earthquake, Pilling doesn’t go so far as to say that 2:46pm on March 11th 2011 was a turning point in history, though he does examine how Japan has defined itself through some very testing episodes. Based on interviews with Murakami Haruki among others, he picks out 1995 (the year of the Kobe earthquake and Sarin gas attacks) as a decisive post-war turning point for Japan, which really spelled the end of the boom years. [t]hough we have got used to the idea of Japan’s inexorable economic decline, it remains quite comfortably the third-largest economy in the world, the size of the combined economies of Britain and France and three times the size of India’s. And this in spite of the cataclysmic events of March 2011. According to the World Economic Outlook Database (April 2013) he notes that Japan had a per-capita GDP eight times the size of China’s (or four times in per-capita purchasing power parity terms). The Tokyo conurbation alone is home to about 37 million people, which is more than the population of whole countries including Canada, Finland or Australia to name a few. I have called Japan home for nearly eighteen years now. And like Pilling, I can attest that there is still much hope in this beautiful country.